I’m in the middle of a long sales cycle and I needed a break so I cleaned out my garage yesterday. That may seem like an awful chore to you but to me it is a metaphor for organizing my thoughts. I love my garage. I’ve made it into a do-it-yourself workshop in which I do everything from change batteries in my kids’ toys to prepare for the 120 MPH winds of hurricane Irma. Last fall I installed a refrigerator in the garage so I could grab a cold beer while working or give my son a bottle of water after a catch out in the yard. During the past three weeks the garage had become an absolute wreck. I had consciously neglected it because I was chained to my desk putting the finishing touches on my new book titled: The 60 Second Sale: The Ultimate System for Building Lifelong Relationships in the Blink of an Eye. Lots of things went by the wayside as I finished the book. I stopped exercising and I ate a lot, so I’ve gained about 15 pounds. My daily workouts with my son also stopped, so his baseball and martial arts skills are rusty. I also neglected sending out my weekly email, for the first time in about nine years. All because I was focused on this one, special project. The book writing process is identical to a long sales cycle. As the person leading the sales effort, you are the only one who sees the value at the outset but you have to sell that vision to everyone else. This means you have to clearly articulate the vision. You have to demonstrate the outcome your client will receive. Then you have to go out and win over the constituents, one-by-one, until they take up the fight for your vision to become real. That’s how a long sales cycle works. While the outcome is critical (you want to close the deal and I finished the book), just as important is what you will learn about yourself in the process. Through discipline and focus, all things are possible. I completed a 60,000 word book in less than a month but I did the bulk of the writing over a two week period. I had a schedule and I stuck to it. I wrote, on average, six hours per day and that was enough time to get the book done – even with writing and rewriting some of the more challenging parts. You can certainly do this with a sales process. Do your research and then focus on contacting the correct people for appointments, prepare presentations and schedule al the meetings. Suspend your need to do everything and focus on the one thing that matters most in the moment. You know what you should be doing. If you have to put off five or six other tasks while focusing on the main thing, give yourself permission to do so. You’ll be able to “catch-up” when after you close the deal. After you close the deal, reward yourself. When I turned in the manuscript, I took a few days off to relax. I didn’t jump right into the next big project. 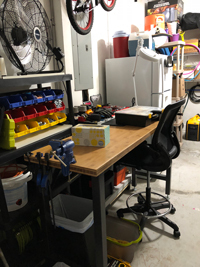 Of course, I got a haircut and cleaned the garage and did everything else I had neglected, but I didn’t jump back into writing until today – a fill week after I finished the book. Why? Because I needed a break. The same thing is true when you close a huge deal. Celebrate. Enjoy the moment. relax for a couple of days. Then when you get back to it, you’ll be refreshed and ready to go. As I mentioned at the outset, I’m in the middle of this sales cycle because writing the book was just the beginning. Now I need to start selling the book. I’m refreshed and ready to tackle the next phase of this sales cycle and I’m glad I was able to break it up effectively. You should approach your new big sales deal in the same way.